The best results come from experienced artists who know how to make your lips look soft, full and youthful. New, advanced techniques and effective cosmetic fillers have made lip augmentation more convenient for patients than ever before – you can get more youthful and fuller lips in just a few minutes. However, a few minutes is also all it takes to get overfilled, strangely large, and unnatural looking lips, commonly known as “duck-lips”. While many doctors and non-physicians offer dermal fillers for lip augmentation, it’s important to look for a cosmetic surgeon who appreciates the various subtleties of available fillers, and selects the right ones for the right places. Fullness with subtlety is the best approach to youthful, natural looking lips that enhance your unique facial character, not change or distract from it due to large lips. Lips can be enhanced to instinctively draw the eye to naturally beautiful balance and proportion. 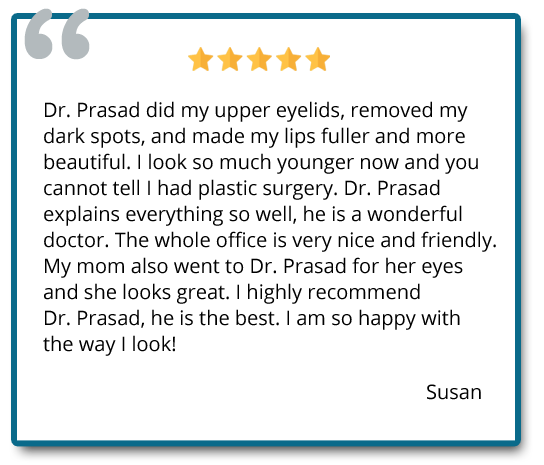 Dr. Prasad’s approach to lip augmentation is to make volume and size naturally fit into a person’s face. He accomplishes this by following a beauty standard known for thousands of years as the Golden Ratio, or Phi. The Golden Ratio is the ratio of 1:1.6, which is a pervasive proportion of beauty found in all of nature, from places as diverse as sunflower petals to nautilus shells. We are subconsciously drawn to this ratio in beautiful faces from every part of the world. The lips are an important element of the face where this balance can be maintained or restored if nature or age has left a slight disproportion. 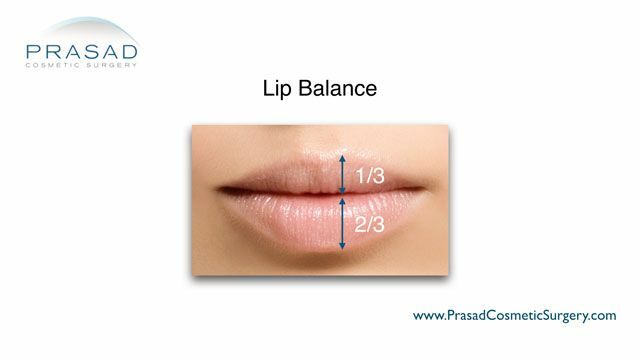 The Golden Ratio/ Phi is followed by Dr. Prasad for an ideal balance between the upper and lower lips, while maintaining proportion to fit within a person’s face. The Golden Ratio can be simply put as one-third of total lip volume to the upper lip, and two-thirds of lip volume going to the lower lip. Following this natural equation of attractiveness draws eyes toward your lips, and adds another attribute of beauty to the whole face. Applying the Golden Ratio is not the only concern. You can still have oversized lips that are considered distracting if the procedure is not performed properly and if the proportion of the lips are not suited for the context of the face. 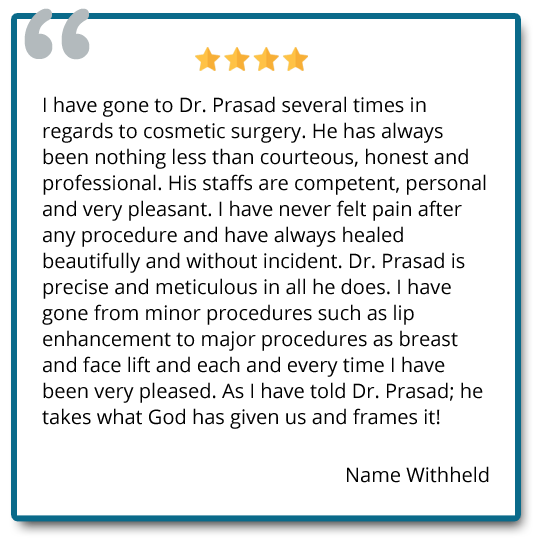 Dr. Prasad’s uses his natural aesthetic to make the volume of lips fit within the face for subtle fullness and body. Lips shouldn’t be the focal point of the whole face, but instead should add to the beauty of the whole. 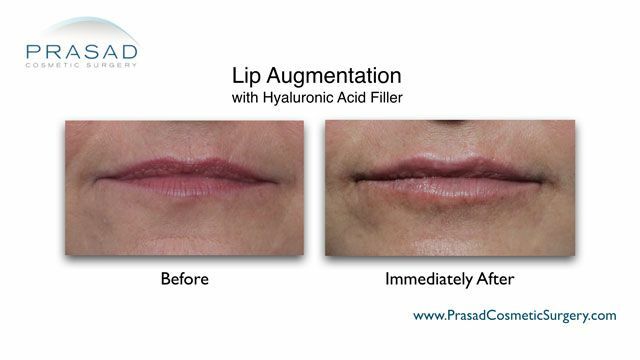 Although lumps after injectable fillers in the lips are common, Dr. Prasad uses innovative techniques to minimize swelling after filler placement which makes final results more predictable. Fullness and body of the lips – blunt tipped cannulas can achieve full-bodied volume, while maintaining natural-looking proportions of the lips better than needles. A cannula allows for more even distribution of the filler and more shaping. More subtle curves are possible with this technique. Less pain for the patient – a major obstacle in considering lip enhancement is pain, especially since the lips are among the most sensitive parts of the body. A blunt cannula can be used for applying topical anesthetic, and for application of the lip filler itself with far less discomfort. Fewer pokes/points of entry – unlike a sharp needle, the blunt tip of a cannula can be re-inserted through the same original point of entry in the lips, so fewer entry points are needed. The blunt tip can also glide through soft tissue of the lips, unlike a needle that can pierce or injure soft tissue inadvertently. A different sized cannula can also be inserted into a previous entry point, so fine enhancements can be done without additional pokes into the skin. Less swelling – Fewer points of entry also results in less reactive swelling from piercing the skin. Blunt tip cannulas also cause less incidental issues such as inflammation and bleeding that lead to swelling. Reduced bruising and bleeding – sharper needles can mistakenly hit a blood vessel and rupture them, leading to bleeding and/or bruising. With blunt tips less likely to pierce a vessel, chances of bruising and bleeding are significantly reduced. More precision – longer cannulas can go to harder to reach spaces of the lips, without additional pokes to the lips.. The blunt tips do not snag or pierce soft tissue and vessels within the lips, which are a risk with sharper needles. To get the same precision with needles, more entry points are needed. Needles can still be used in combination with blunt cannulas when needed in individual cases to get the best possible results in lip volumizing. Restylane Silk – is the first FDA-approved filler specifically for use in the lips, and the surrounding areas and surrounding wrinkles around the mouth (AKA smoker’s lines or perioral rhytids). Restylane Silk is also a softer hyaluronic acid filler, with added lidocaine to reduce pain during the procedure. Results last about 6 months. Juvederm Ultra XC – a popular, long-lasting, yet soft hyaluronic acid filler for the lips. 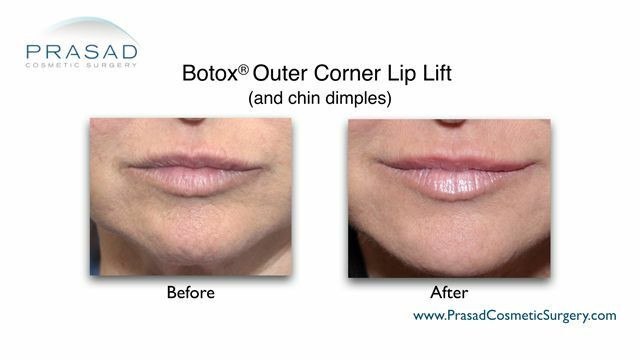 Dr. Prasad uses Juvederm Ultra XC to add body to the lips.Results last up to 9 months. Juvederm Volbella – a newer hyaluronic acid filler also for lips. Volbella is a slightly thicker filler which Dr. Prasad feels is best used for finer points such as vertical lines surrounding the lips. Volbella lasts from 6 months up to a year. Vertical lines above the lips, AKA perioral lines or smoker’s lines, can be improved with thermal energy treatments like lasers and radiofrequency devices added to cosmetic fillers. Heating the skin to a target temperature can tighten the skin, and induce collagen as a response to the heat of the laser. Laser resurfacing for lip lines can be done in conjunction with a filler to restore lost volume in the area. The type of thermal energy treatment depends on the individual’s skin types, and the nature of lines they want to address. 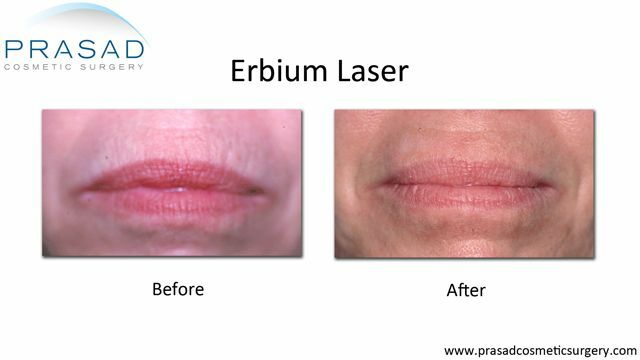 Fractional CO2, Nd:YAG, and Erbium lasers are Dr. Prasad’s choices for effective laser treatment for lighter skin, and for some darker skin types with proper exposure adjustments. Dr. Prasad prefers the Pellevé radiofrequency device for darker skin types. Whether laser or radiofrequency is used, more than one treatment session may be need to achieve best results. Vertical lip lines, commonly called smoker’s lines or perioral lines, can be improved with laser or radiofrequency skin tightening, along with fillers for areas of lost volume. Additional collagen induction can also be achieved while minimizing exposure to lasers with platelet-rich plasma (PRP). PRP is the concentrated wound healing and growth factors derived by spinning your own drawn blood. PRP can induce collagen when injected into the perioral area with or without a hyaluronic acid filler for added volume, and can be used to supplement collagen induction between laser treatments. Excess lip lines can appear when the lips are puckered, giving the mouth a more wrinkled appearance. The strategic placement of a neurotoxin like Botox® in the muscles of the upper and lower mouth called the depressor anguli oris can reduce the activity of this muscle group, so visible dynamic lines when puckering are reduced. With time, even the visible lines at rest decrease as the skin no longer wrinkles due to decreased muscle movement. 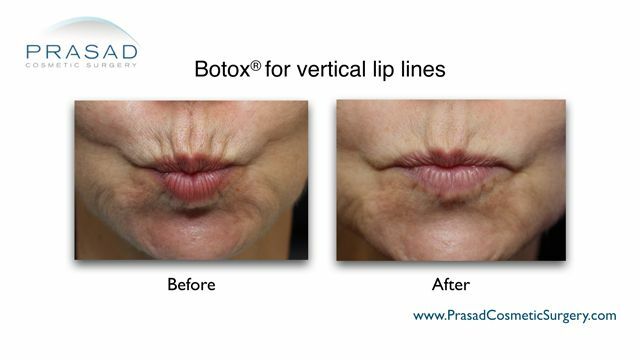 It is crucial to have these vertical lines treated by an experienced doctor as the mouth is one area where excess Botox® placement can lead to temporary paralysis, slurred speech, and difficulty eating. Uneven or crooked smiles, exposing too much teeth or gums when smiling, downturned lips, or permanent frowns can impact confidence, make someone uneasy about smiling, or convey the wrong feeling to others. Smiles can make a quick emotional bond faster than words, so they are an important part of how we communicate with others. When you are unhappy about the way you smile, it can impact personal relationships. Correcting a smile is surprisingly easy and convenient for patients, although it does take some precision art from the doctor. A muscle responsible for smiling and downturning lips at corners of the mouth called the depressor anguli oris (DAO) can be manipulated with a neurotoxin such as Botox®, Dysport®, or Xeomin® to relax it so that the outer corners of the lip elevate. 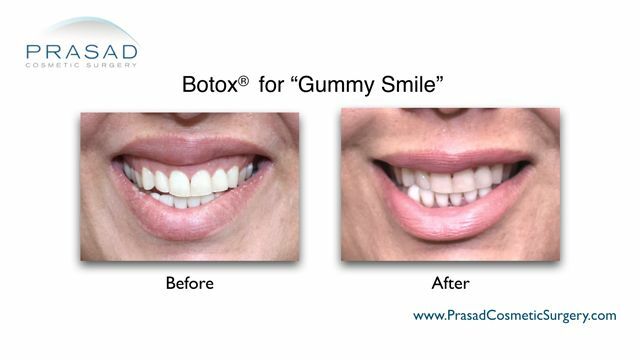 Injecting a neurotoxin to specific areas can help even out a crooked smile, elevate a downturned smile, or reveal less of the gums when smiling. Treatment takes a few minutes with an injectable like Botox®, and a follow up two weeks after treatment when the peak effects of the neurotoxin are seen. It’s at the two week point that the need for additional enhancement is determined by Dr. Prasad. As the effects of neurotoxins do wear off, regular maintenance is needed to retain the upturned position of the outer lips. Covering excessively exposed teeth or gums when smiling may also be done with volume correction in areas where the lips are thinner than others, and reveal more of the mouth. 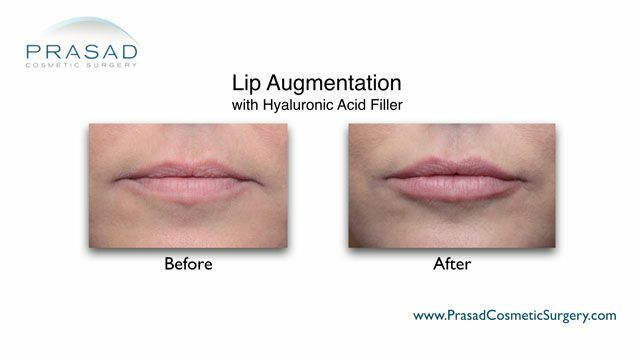 This can be done with hyaluronic acid fillers placed at specific parts of the lip that have less volume than the rest of the lips, which can be determined by Dr. Prasad upon examination. If you feel your lips can look their best through enhancement, contact us at (212) 265-8877 in our Manhattan location, or (516) 742-4636 at Garden City, Long Island, with phone lines accessible 24/7, or by filling out the contact form below, and we will get back to you.